shimmery threads in late summer/autumn colors! 1. 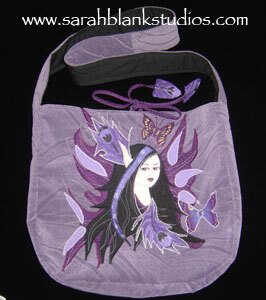 I’m making a series of smaller faerie bags, 58 dollar range. Stay tuned! 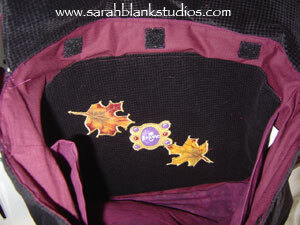 Lots of new, durable material in shades of purples, greens and blues, The perfect background colors for your faerie bag! 2. 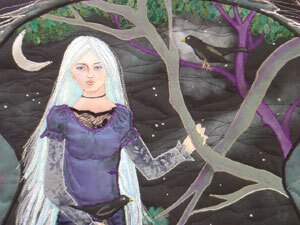 Finishing up some art quilts, including “Blackbird”. 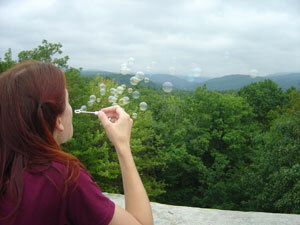 See previous journal entry for the photos. 3. 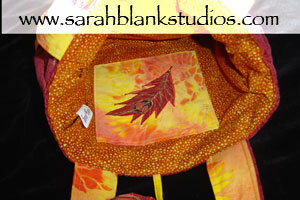 I’ve been practicing silk painting with dyes all summer long. A very challenging medium. 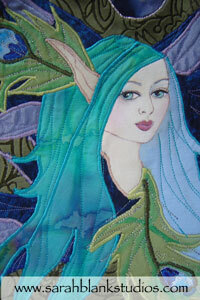 I hope to have some silk wall hanging art up soon! 4. Finishing a commissioned messenger bag. 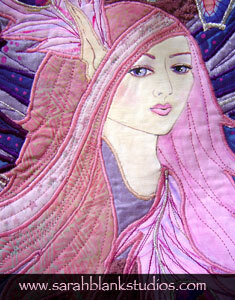 See the faerie applique below. Her face is hand painted. 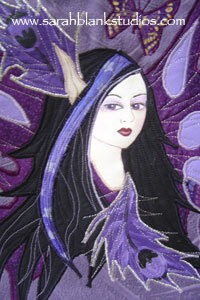 She wears a dress made from shimmery purple fabric, batiked fabric and lovely vintage black lace. Very delicate! 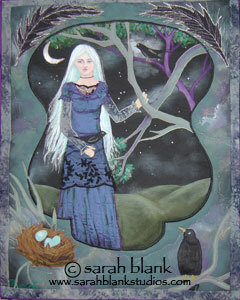 She touches twisty branches where a blackbird perches. Sparkley silver stars shine behind her. 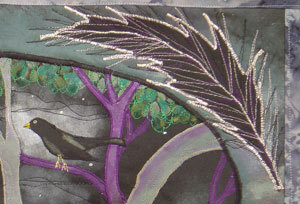 Two blackbird feathers adorn the top of the wall hanging. 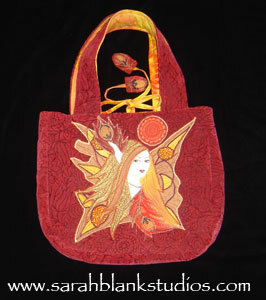 They are made from hand painted fabric and LOTS of shiny silver thread. 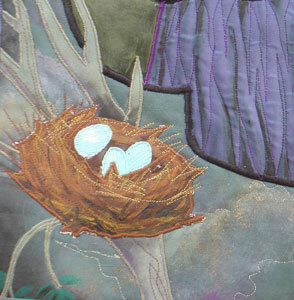 A nest on the bottom left side of the wall hanging houses three blackbird eggs. 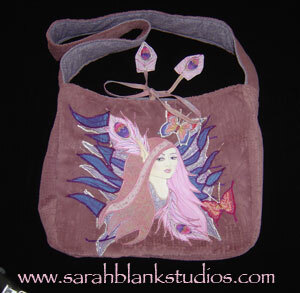 This magical PINK bag has one padded shoulder strap (sling it across your chest), peacock feather ties, and is made from super SOFT and very durable fabric! Detail of the hand painted face, appliqued by ME! 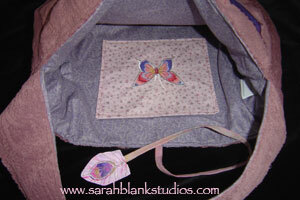 Inside has a cute pocket with a butterfly applique. “Blue Peacock Feather” fae bag. 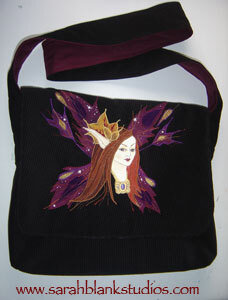 Very detailed fae applique on front, peacock feather ties, long strap fits comfortably across chest. And a dragonfly too! This one is a smaller size!!! 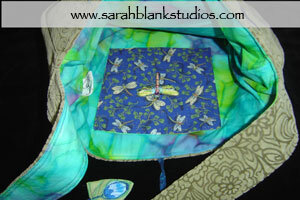 Inside had a pocket with cute dragonfly applique! The lining is made from authentic licensed Cicely Mary Barker Faerie print fabric! SOOO cute. Bags not up on my site yet. Email me at sarah@sarahblankstudios if interested. 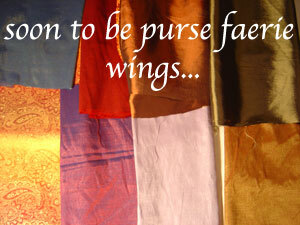 See my previous two journal entries for 3 other fae bags! 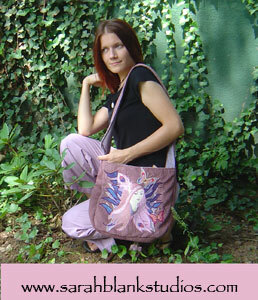 The pink bag is 118.00 plus shipping (usually between 6-8 dollars). 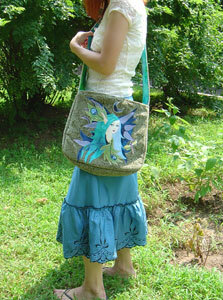 The blue bag is 58.00 plus shipping (between 4-6 dollars). 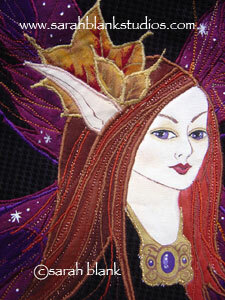 Thanks for looking my dear faerie! 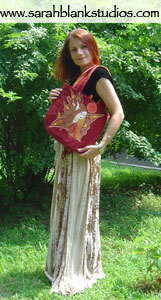 This magical bag has 2 over-the-should straps, peacock feather ties, and is made from super SOFT and very durable fabric! Detail of the hand painted face, appliqued by ME! Lots of pixie dust around her eyes. Inside has a batiked pocket with a hand painted peacock feather applique. 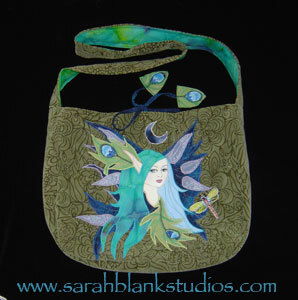 “Green Peacock Feather” fae bag. 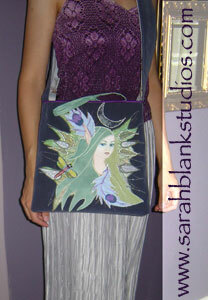 Very detailed fae applique on front, peacock feather ties, long strap fits comfortably across chest. And a dragonfly too! Green and blue peacock feathers with shimmery stitched detail. Hand painted face. 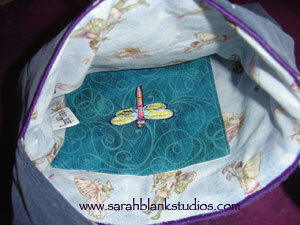 Inside had a pocket with cute dragonfly applique! Bags not up on my site yet. Email me at sarah@sarahblankstudios if interested. 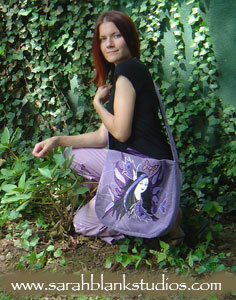 See my previous journal entry for the “Purple Peacock Feather” fae bag! This bag is SO soft. 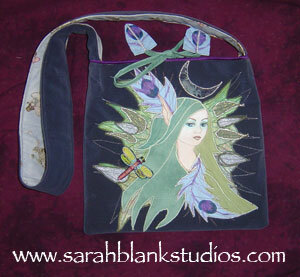 Very detailed fae applique on front, peacock feather ties, long strap fits comfortably across chest. Purple peacock feathers with shimmery silver detail and dark fae girl (with purple eyes!) Butterflies too! 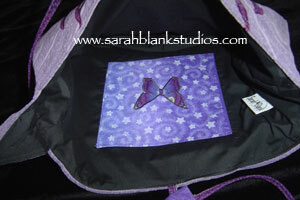 Inside had a pocket with cute butterfly applique! 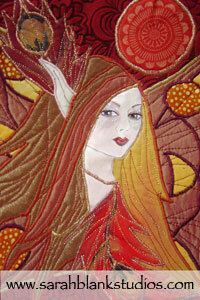 I have been incredibly busy stitching up new creations. Here’s a teaser photo! Five new peacock faerie bags coming tomorrow (includes other things of wonder such as dragonflies, butterflies and the moon! ).